CANES VENATICI the Hunting Dogs is a small and faint grouping, but the brightest star, Cor Coroli, is ranked a magnitude 2.9. 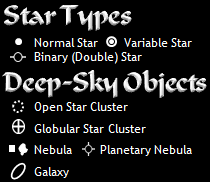 Fortunately, there are many wonderful deep-sky objects for stargazers with their telescopes and binoculars (The constellation to the south, Coma Berenices, has even more). There are 3 "bordering" constellations: Bootes (SW), Coma Berenices (S), and Ursa Major (E). Now you know more about Canes Venatici!